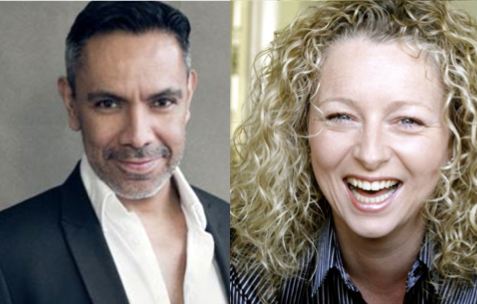 Olivier Award winner David Bedella will play razor-wielding madman Sweeney Todd and Sarah Ingram his pie-making partner in crime, Mrs Lovett, in an intimate new production of the Tony Award and Olivier Award-winning musical, Sweeney Todd: The Demon Barber of Fleet Street. Sweeney Todd: The Demon Barber of Fleet Street, with music and lyrics by Stephen Sondheim, book by Hugh Wheeler, will kick-off the autumn season at Twickenham Theatre in West London. It will start previews on Wednesday 10 September and runs to Saturday 4 October. Press night is Tuesday 16 September at 7.45pm. The new venue’s first in-house show is a co-production with West End producer David Adkin. David Bedella was a triple award winner, named Best Actor in a Musical at the 2004 Olivier Awards, the Evening Standard Awards, and The Critics Circle Awards, for creating the role of the warm-up man Jonathan Weiruss/Satan in Jerry Springer The Opera. He appeared in the role at the National Theatre, in the West End, the Sydney Opera House and in New York in a concert version at Carnegie Hall. On television David most notably played Dr Carlos Fashola in Holby City and more recently guest starred in By Any Means and Inside No. 9, all for BBC, and his film credits include Alexander and Batman Begins. His other West End starring roles include Frank n Furter in The Rocky Horror Show, Billy Flynn in Chicago, and Hedwig in Hedwig and the Angry Inch. He starred as Arnold in Torch Song Trilogy and Wilson Mizner in Sondheim’s Road Show, both at the Menier Chocolate Factory. In the past year he played Man 1 in the acclaimed production of Sondheim’s Putting It Together at St.James Theatre and Kevin in Into The Heights at Southwark Playhouse. Sarah Ingram’s many West End musicals include Oklahoma!, South Pacific, Martin Guerre, Inherit The Wind, Flashdance, Imagine This, Muderous Instincts and Napoleon. She worked with David Bedella on Sondheim’s Road Show at the Menier Chocolate Factory. Most recently, Sarah played Josie in the revival of the Boy George musical Taboo at Brixton Clubhouse following her critically acclaimed performance as Miss Hannigan in Annie at West Yorkshire Playhouse. Mark McKerracher (Judge Turpin). His West End starring roles include The Phantom in The Phantom of the Opera, Jean Valjean in Les Miserables, Sunday in the Park With George, Ragtime, Cats and The Bodyguard. Zoe Curlett (Beggar Woman). Her West End starring roles include Christine in The Phantom of the Opera and Cosette in Les Miserables, and Cats and The Secret Garden on UK tour. The rest of the cast includes: Shaun Chambers (Pirelli), Genevieve Kingsford (who makes her professional debut as Johanna), Mikaela Newton (Tobias), Josh Tevendale (Anthony). Director Derek Anderson, Musical Supervisor Tim Jackson, Musical Director Ben Holder, Set Design Rachel Stone, Costume Design Olivia Ward , Sound Design Joel Price, Casting Anne Vosser, Producer David Adkin in association with Twickenham Theatre.